It's time to get ~fancy~ body art! Watercolor tattoos look more stunning than regular black tattoos, and they stand out regardless of the size. They're perfect for dainty ladies and artsy folks. Just like a painting, a watercolor tattoo calls for skillful and artistic hands. If you're planning on getting one for yourself, make sure to book an artist who is experienced with this kind of style and technique. Otherwise, your colorful ink may end up looking messy and dirty, and it will most likely not age well. Already have a design in mind? Read here for the eight local tattoo artists you can contact to get your fancy body art done! How to contact: Email her at wijilacsamana@gmail.com or message her on Facebook. If you're eyeing tiny symbols, delicate flowers, and painting-like designs inked on your body, Wiji's your girl. Her artistic tats always look like illustrations drawn on a clean notebook. How to contact: Send him a private message on Instagram or message him on his Facebook page. Dyun's brush-like strokes are simply impressive! How to contact: Email her at gigiebearrr@gmail.com. Ed's Note: You'll have to wait a while before getting an appointment because according to her Instagram, she's already booked until the end of 2017. Gigie can troubleshoot past tattoo problems with cool, colorful designs—that's talent! How to contact: Email him at jhaycolistattoo@gmail.com or message him on his Facebook page. The way Jhay blended the colors is simply mesmerizing! How to contact: Email her at katztatztattoo@gmail.com or check out her website www.katzlorenzana.com! Ed's Note: Katz's website is down rn, but she is aiming to get it back up by the first week of December! If there was such a thing as the "Queen of Watercolor Tattoo Artists," Katz would be it. 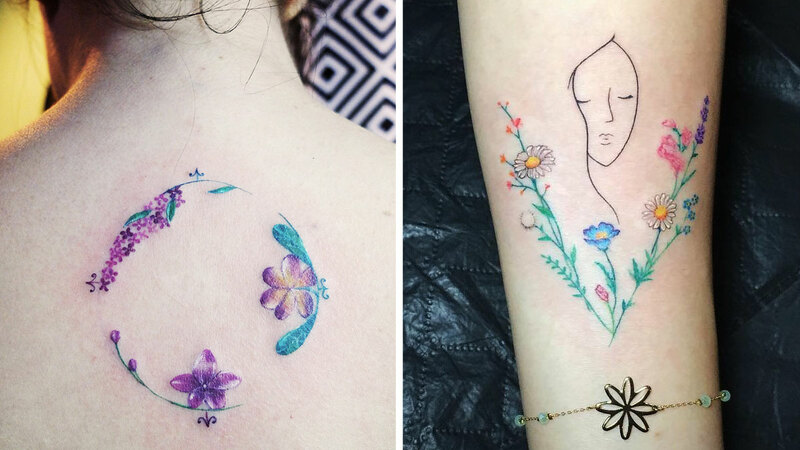 Her IG account is filled with ethereal tattoos that will make you want to get one on every part of your body! How to contact: Send a private message on Whiplash Tattoo's Instagram or contact them at 0998-557-4421. Aside from classic shapes and images, Jonti proves that watercolor tattoos can also be done with words and heartbeats. Amazing, right? How to contact: Email her at miaclaravallreyes@gmail.com or message Chronic Tattoo x Culture's Facebook page. Mia may be more known for creating black tattoos, but she's also a pro in shading colors that make your fancy body art look ~*real*~! How to contact: Email him at vintados@gmail.com.